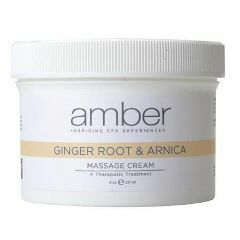 Ginger and Arnica oils blend with the Soybean Oil, Vitamin E and Aloe cream base to nourish the skin and reduce inflammation. Ginger Root, with over forty anti-oxidant compounds, Vitamins A, C, E, and K, is known for its ability to relieve aches and pains. Arnica Oil, loaded with Sesquiterpene Lactones helps to block pro-inflammatory Cytokines reducing inflammation, soothing arthritis and other mild discomforts. Ginger Root also stimulates blood flow to help increase circulation. Easy glide - breaks down to an oil consistency. Nut Free.